During the production of "Islamic Art: Mirror of the Invisible World," which airs this Friday (6/07/2012) as part of the PBS Arts Summer Festival, Robert Gardner filmed some of the most stunning examples of Islamic architecture in the world. Two buildings that represent a great contrast and diversity in Islamic architecture are the Taj Mahal in India, probably the best known Islamic monument and one of the most memorable buildings in human history, and the Great Mosque of Djenne in Mali, the largest mud construction in the world, an astonishing example of indigenous African adobe architecture. 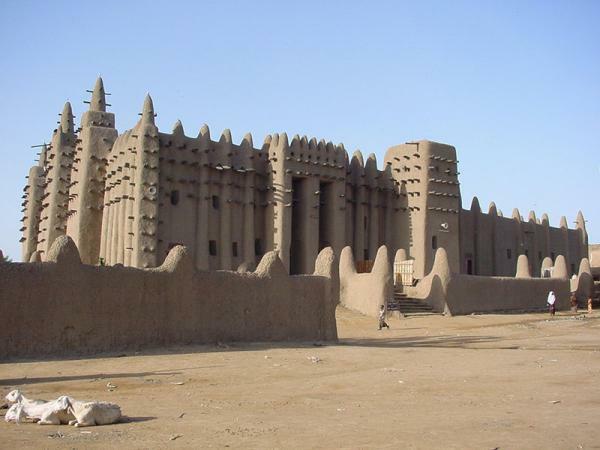 In stark contrast to the polished marble and stone inlay of the Taj Mahal, the Great Mosque of Djenne is built entirely of cylindrical mud bricks, with a surface of mud stucco - an African architectural technology that has been in use for more than a thousand years. The only decoration on the smooth exterior comes from the diagonal shadows of the logs regularly protruding from its surface. These logs are used as scaffolding for the annual resurfacing of the building that serves to preserve it after the heavy rainy season. Lire l'intégralité de l'article et visionner le diaporama publiés sur le site du Huffington Post (en lien).